Treat your kids to a day in the Yorkshire Countryside enjoying traditional country pursuits at Coniston Shooting Ground. Set in the midst of a 1600 acre estate, children aged 10-14 will learn new skills and enjoy some friendly competition at our North of England Premier Plus Shooting Ground. Activities include Clay target shooting, Archery, Falconry and Air Rifles, giving your youngsters a new appreciation for what the countryside has to offer. After a comprehensive Safety and Gun Handling Talk performed by a qualified Instructor, the group will be split into two smaller teams. Each team will shoot a 15 bird competition on a variety of different targets. Teams will then be taken to our covered archery range and will be taught an age old sport that was once compulsory for all children to practice every week. Teams will break for Lunch, pack lunches will need to be provided by parents, all though food and drinks will be available from the cafe. We have a wide variety of birds of prey, from Golden Eagles to Tawny owls. After a welcome from one of our full time Falconers, a demonstration will be given and an opportunity to fly one of the birds. After a briefing/safety talk each group will spend a little time zeroing the rifle before starting a field target comp course. All this for £75 per child. 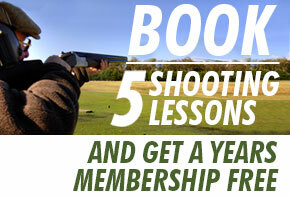 All instructors are fully licensed certificated gun holders and members of Coniston Shooting Ground. We are available for any questions prior to the start of the day. WHY NOT BUY A VOUCHER FOR ONE OF OUR DAYS HERE, REDEEMABLE ON BOOKING ANY ONE OF OUR KIDS DAYS. please call Sarah on 01756 748586.